#1.1 What are the Qualities of Good Shooting Gloves? #1.2 12 Best Tactical Gloves on the Market! #1.3.1 Why Wearing Shooting Glove is Essential? 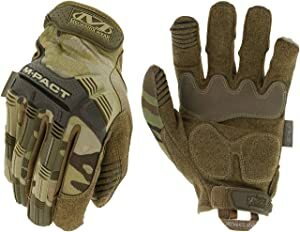 #1.3.2 What Kind of Gloves Does the Military Use? #1.3.3 What are Gloves Made Out of? #1.3.4 How to Wash Shooting Gloves? #1.3.5 Do Shooting Gloves Work on Touchscreens? #1.3.6 Do Tactical Gloves Affect Shooting Accuracy? #1.3.7 Where to Buy Tactical Gloves? Every advantage you can give yourself when you are going out to the range, out hunting, or using your firearm in other situations is to your benefit. You want to have accessories that improve your accuracy and performance, and shooting gloves can be one of the best choices to assist you to be able to do that. These gloves can improve your grip, reduce impact or abrasions, and help you to feel more comfortable while you are outdoors with your firearm. This is why the vast majority of military personnel, police officers, and other professionals who use firearms also use shooting gloves. They find them to be an essential accessory. What are the Qualities of Good Shooting Gloves? Shooting gloves can be the perfect accessory for you to purchase, but knowing what to look for in the glove is as important. Before making a decision on which gloves you want, here are a list of key features you should consider. Budget. Let’s be realistic about it. You may find some gloves that are absolutely ideal for you, but are simply out of your range. By something you can afford. There are great choices out there so be sensible. Warmth. If you are a person who is intending to use your shooting gloves in situations where the temperatures are below freezing, understand that not every product you find will work for you. The vast majority of these gloves are made for environments where the temperature is 50° or above. Therefore, they would not properly protect your hand in cold weather temperatures, which can lead to injuries. It will also cause your hands to become cold, which can decrease your grip, flexibility, and performance. Size. Like any pair of gloves, size is absolutely essential. You want a row gloves that fits your hands perfectly. If the gloves are too loose it can decrease your grip on your firearm. If they are too tight, it can limit your flexibility. Durability. The material that gloves are made with is important for reasons beyond warm. You want a pair of gloves that will last, so finding options that are made with durable materials is important. Plus, you want gloves that will help protect your hands. If you are a person who is intending to wear these in circumstances where you are spending a lot of time outdoors you are likely to find that there are a number of hazards that can scrape or cut your hands. Choosing a durable glove that protects you from those kinds of hazards is important. Breathability. Another big factor to consider is how well the gloves keep your hands dry inside. Breathability is an essential part of the glove, because it allows air to circulate in the glove so you do not sweat. 12 Best Tactical Gloves on the Market! Now that you have some factors to consider when choosing the right shooting gloves for yourself, here are 12 options we feel you should take a closer look at. One of these is bound to be the perfect option for you. This model of gloves has been around for some time, and for good reason. These gloves are the preferred choice of military personnel, and were even worn by the actors in American Sniper. In reality, these are the best tactical gloves for many. The features of this love are magnificent. They start with the fact that it comes with a 0.8 mm synthetic leather palm that gives you great tactile feel without creating a situation where the gloves are weak or lack durability. The leather is intended to add longevity, and these have been time tested and proven to last longer than many of the other comparable brands on the market. The patented TrekDry technology is used throughout the design of these gloves, not only improving and giving maximum comfort level, but also providing a breathable glove. This is the perfect choice for those who are going to be in hot, humid climates where perspiration can be a serious issue. Not with these gloves, as they are specifically designed to keep your hands cool to give you a better grip. The camouflage color is perfect to conceal your hands, and you will find that you have a sensational grip. One that allows you to be able to pick up small items while still having a durable and warm glove to wear during the winter months. Consider that who face life and death situations on a daily basis consider these to be the perfect gloves to wear, and that is why you may want to consider them for yourself. They are padded to absorb shock and vibration, yet still give you a tight grip. You won’t find anything better. 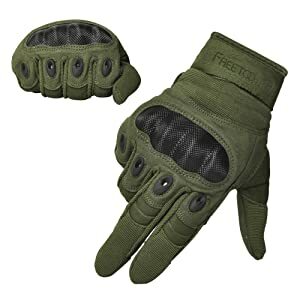 This FREETOO product provides half and full fingered gloves that are hard knuckled to handle any kind of environment or terrain. These are lightweight gloves that will fit your hands perfectly. They will keep your hands warm in cooler temperatures and are breathable during hot days to ensure that you don’t have sweat or perspiration buildup. The knuckles are molded with a hard plastic that not only protects against abrasions, but gives you an additional protection should you need to defend yourself. You never know what may go on, and these gloves are made to ensure you get maximum protection. The Palm is made of a reinforced antiskid material that soaks up and absorbs sweat, as well as reduces impact and vibrations. That makes it easier for you to spend a long day out at the range or hunting and not have to feel the pain of continual impacts against your hand. If it is warm enough outside, you can choose the half fingered gloves as your option. This gives you additional comfort and allows you to be able to have direct contact with the trigger if you so desire. Some prefer the more sensitive touch of their own finger directly against trigger. The one thing we can say about this choice is that it can be used in almost any kind of circumstances. 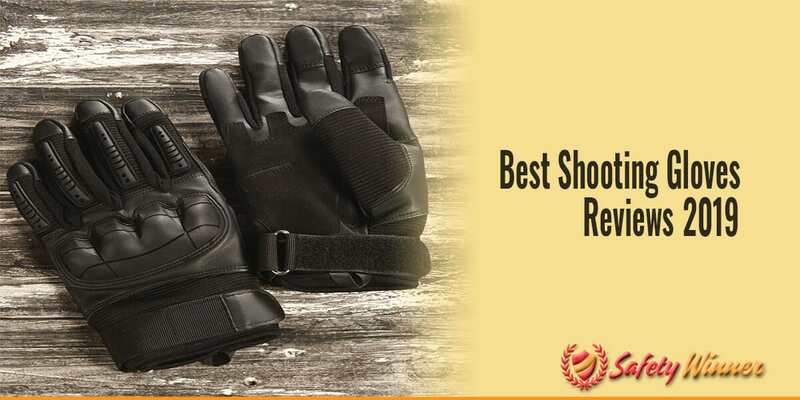 Because of the protective nature of the gloves and the fact that it breathes well it is perfect if you’re going out for a ride on your motorcycle or bike, you are out at the range, maybe even if you were going to the batting cage for a round of hitting balls. This is a sensational choice that will give you a great deal of protection and make you feel comfortable all day. 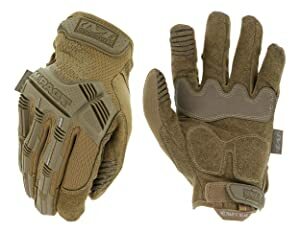 This is another great Mechanix product that you will truly find is ideal for you. These gloves are well designed, giving you great flexibility while also giving you great tactile sensation. Made with a seamless 0.88 synthetic leather palm, this gives you the kind of dexterity you need to be able to grip and grab things while still giving you a high level of durability. The gloves not only give you a great feel, but are specifically designed to protect you from impact and abrasion. The exterior of the gloves comes with additional padding and molded plastic covering that will keep you from scratching or scraping your hand against objects like rocks, trees, or getting cut by sharp objects. Plus, it is specially padded so that the impact of the weapon is absorbed as well. These gloves are breathable, meaning that you can ensure that you are going to get maximum comfort during hot or humid days. This is especially important considering that these gloves form fit around your hand, yet keep you dry all day. A comfortable wrist closure even ensures that the gloves staves firmly in place around your hand. This is a camouflage color glove, ensuring they are not giving you away. It’s a truly fantastic love that you could wear out at the range, or take with you to use as you head to the batting cage, or out for a ride on your motorcycle. The padding and comfort is something that is not matched by many other options out there, and you will find this to be a fantastic choice. #1 Why Wearing Shooting Glove is Essential? This is one of the most common kinds of questions that people ask about this kind of product. They are looking for a reason to not purchase them, and it is true that you could enjoy your time out at the range or out hunting without using a shooting glove. However, if you have used them before then you understand the great benefits that they provide. You will be glad you bought yourself a pair once you try them on and use them a few times. #2 What Kind of Gloves Does the Military Use? The Mechanix brand has really set themselves apart in terms of military use. However, don’t get yourself set in using gloves that everybody else is. Try a few of these out to see how they feel. There are great brands and options made from a number of different manufacturers. #3 What are Gloves Made Out of? It really depends upon the kind of glove you were buying. Most are made with some form of leather and/or nylon but that is not the only materials that are used. What matters to you when determining the type of materials used in the glove you are looking at is dependent upon how much protection you need for your hands and whether you intend to use them in cold-weather climates. #4 How to Wash Shooting Gloves? Many of the options in this list are machine washable. All you have to do is run them through your washing machine and a gentle cycle and let them air dry and you are good to go. #5 Do Shooting Gloves Work on Touchscreens? Some do. You have to look at the particular product to see if it works with touchscreens. #6 Do Tactical Gloves Affect Shooting Accuracy? The glove itself does not directly impact your shooting accuracy. However, it has an impact in a number of other ways. It starts with the fact that the gloves give you a better grip when holding your weapon, which can help in accuracy. Many of these gloves are both waterproof and breathable, ensuring that your hands don’t slip. That can have a dramatic impact. In addition, many of these clubs come with impact resistant protection. If you are using your firearm for an extended period of time, the gloves protect your hands from becoming sore or bruising, which can have an impact on your accuracy. #7 Where to Buy Tactical Gloves? These gloves are available in a wide variety of locations. For your convenience, we have included a link to each of the gloves where you can purchase them on Amazon.